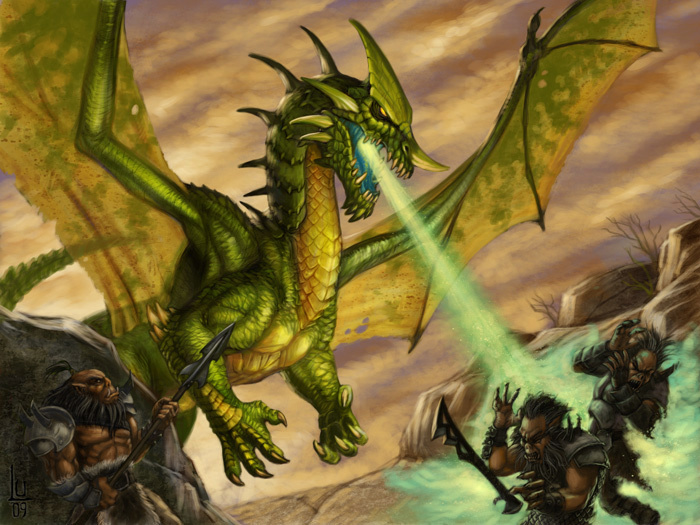 Over the past few years Dungeons and Dragons has made a big come back and I wanted to shed some light on why I love this game. The fact is the game lets you be anyone, you can do anything and in that spirit I want to tell you about my character and how I have come to enjoy playing as her, which some people still think is weird. Full disclosure I have borrowed art from other sources to help round this out, so any pictures you see are not mine. My character is named Temi though she has multiple names, so for the majority of the story she will be known by her adoptive name of Kököchin. Kököchin is a Chaotic Good character in that she always tries to do what is right by her, yet she is very uncivilized. 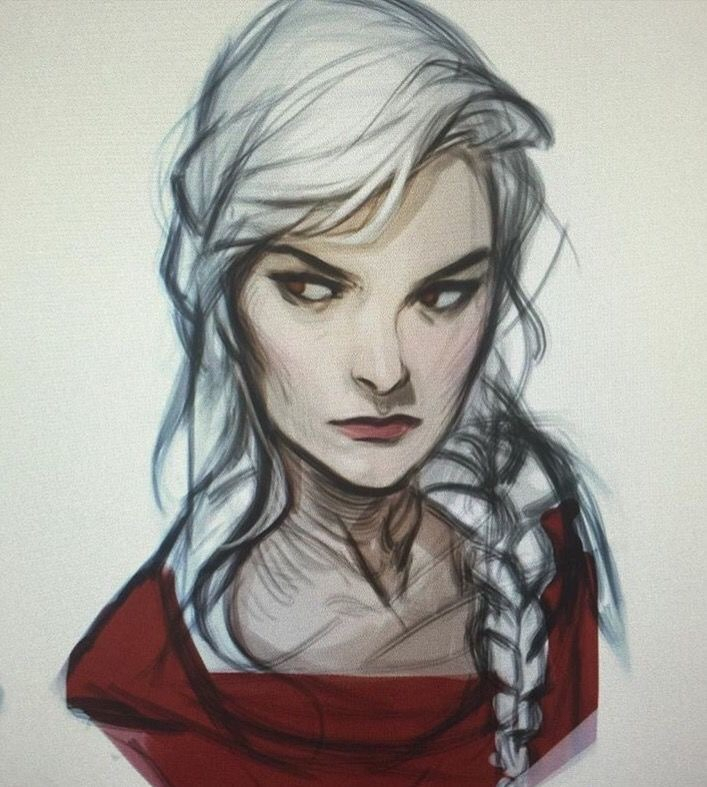 This is how I often imagine my character only with a more blue tint to her skin. 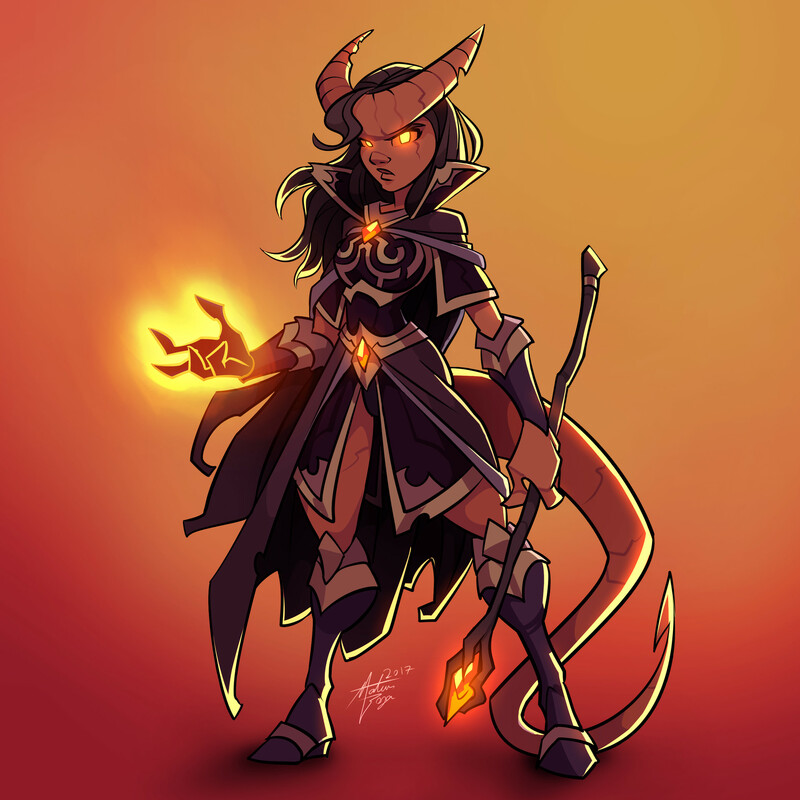 So first off many of you are probably wondering, what is a Tiefling? 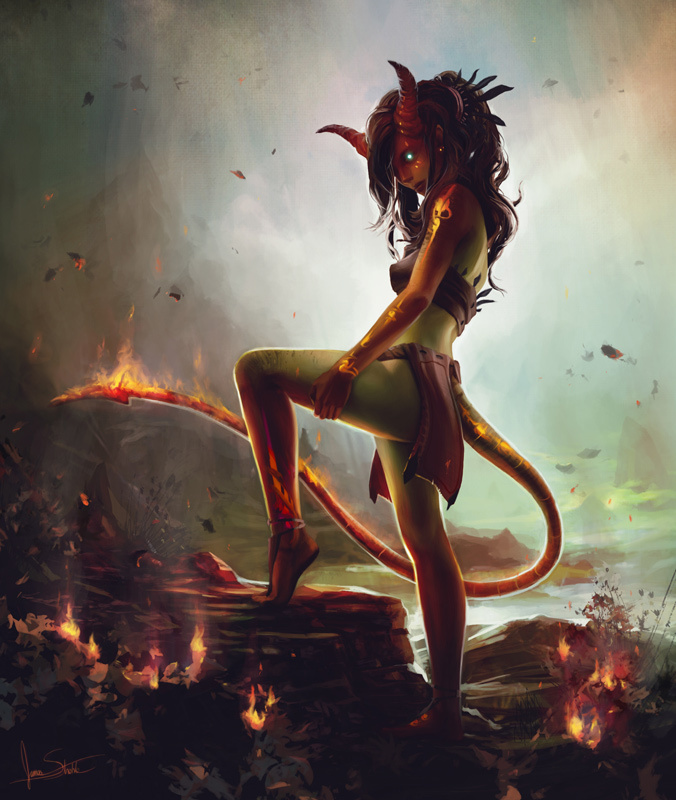 Tiefling’s are descended from humans who made pacts with infernal demons and this has caused multiple mutations within their genes. These mutations include and are not limited too large horns that take any of a variety of shapes: some have curling horns like a ram, others have straight and tall horns like a gazelle’s, and some spiral upward like an antelopes’ horns. They have thick tails, four to five feet long, which lash or coil around their legs when they get upset or nervous. Their canine teeth are sharply pointed, and their eyes are solid colors—black, red, white, silver, or gold—with no visible sclera or pupil. Their skin tones cover the full range of human coloration, but also include other exotic colors. Their hair, cascading down from behind their horns, is usually dark, from black or brown to dark red, blue, or purple. The Tiefling’s have no homeland and many people shun them for they believe that these poor souls are as evil as the demons that helped shape them, but the truth is more complex than that. 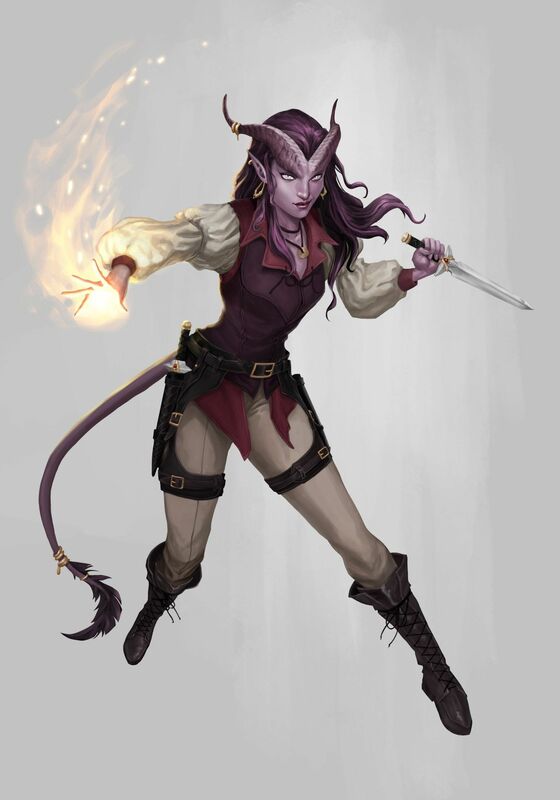 A Tiefling is as good or as evil as any human, though many choose darker paths because they are treated so poorly. Kököchin’s Great Great Grandparents tried to start their own community and had some success at first, until a group of humans drove them from their village and raped and murdered their way through the survivors. On that day they swore revenge. This revenge would be the blood that flowed through the veins of their two Great Great Grand daughters Salsa’il and Arina’il. The leader of the tribe Ardashir actually encouraged his own people to procreate with non Tiefling’s, as long as it would strengthen the blood. This has lead to their Tiefling Blood being briefly diluted by that of a Fey’ri ( An Elf with Demon Blood), a Drow (An evil elf), a Gensai (This is a human who is part elemental, in this case a wind elemental) and also a half elf. This was to help increase their Bloodlines compatibility with certain types of Magic. Of course this was only the minority as the Tiefling blood would always be dominant. Along the way Ardashir would make a few more dark pacts, eventually dieing of old age, the task would be past on to his children and their children eventually leading to the births of twins Salsa’il and Arina’il. One of bright red skin and the other of indigo. They would be the perfect vessels to serve as Avatars for Two of the Archdevil’s. 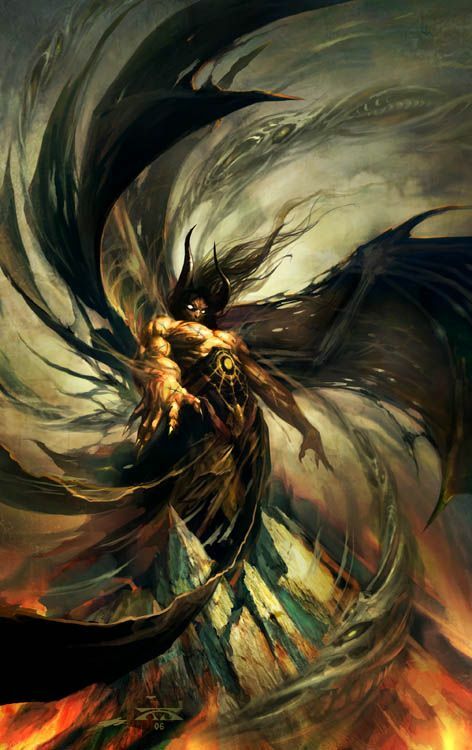 Eventually Semiramis the granddaughter of Ardashir (Mother of my character) would be granted a vision from the Nine Hells and she would lead her people and her two young daughters to the frozen wastes of the Icewind Dale, in order to find an ancient temple. This long forgotten temple was dedicated to Mephistopheles, the lord of the 2nd Hell that of Cania. Though as any wise person knows, there are many forces at work in the world, not just those of evil. And so it was on the day that Semiramis was to reach the temple, a bitter wind forced her party into the territory of the Tribe of The Bear. It was there that they where slaughtered and among the remains the tribes leader found a little Indigo baby, on that day he took her in and named her Kököchin. In the tribe she found great acceptance, this was down to her strength and intelligence. Even as a young child she quickly gained the respect of those around her when two slightly older boys insulted her, she used her tail to whip snow in the face of one boy while headbutting the other and breaking his nose. To this day the tribe still laughs about the incident and the boy with the crooked nose even tried to win her hand on more than one occasion. In the end she only ever had eyes for one person. When she was a bit older her father would take her to the town of Targos where the Tribe of the Bear would trade Pelts and preserved meats for more ‘Civilized goods’. It is here that she would meet her truest friend Laurel Kelly. Laurel was the Granddaughter of the town lord and he doted on her. He was happy to trade with the Tribesmen who lived the Dale but he never fully accepted them, especially the freak demon daughter of their chief. Due her mother being stricken with an unusual illness while she was pregnant Laurel was born different among her peers, she had deep golden eyes, ice white hair and pale skin, mix that with a hostile denouement and most of the other children stayed away from her(dubbing her the Ice Queen), This is probably why she grew so close to the Indigo girl from the bear tribe. 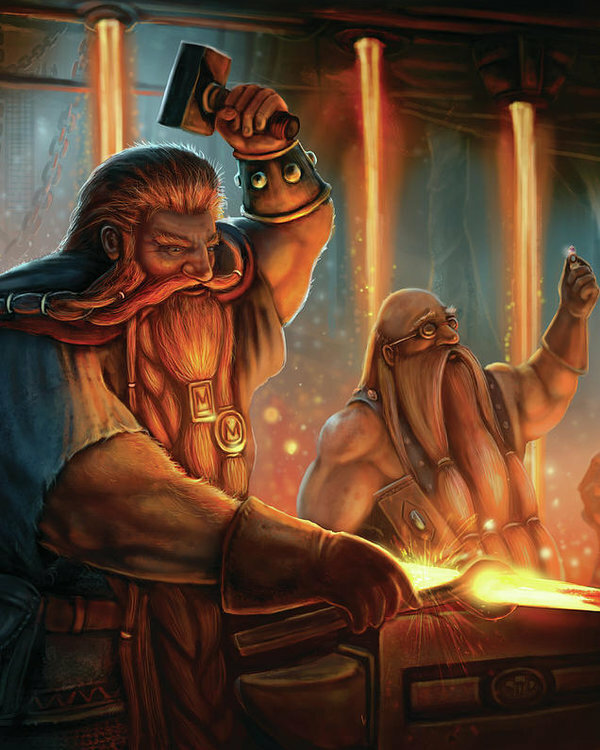 During one of the meetings between the people of Targos, the local tribes and even some of the local Dwarve’s the two girls while playing a prank accidentally damaged the cart of the Dwarven Cleric Banac of Battlehammer. The girls not wanting to get to into trouble quickly set about fixing the cart, little did they know they where being watched by Banac himself. Impressed with the girls skill and display of honor he requested that they come and train with him, which they both gladly did. In time Laurel became a master smith while Kököchin would become a lover of history and stories. 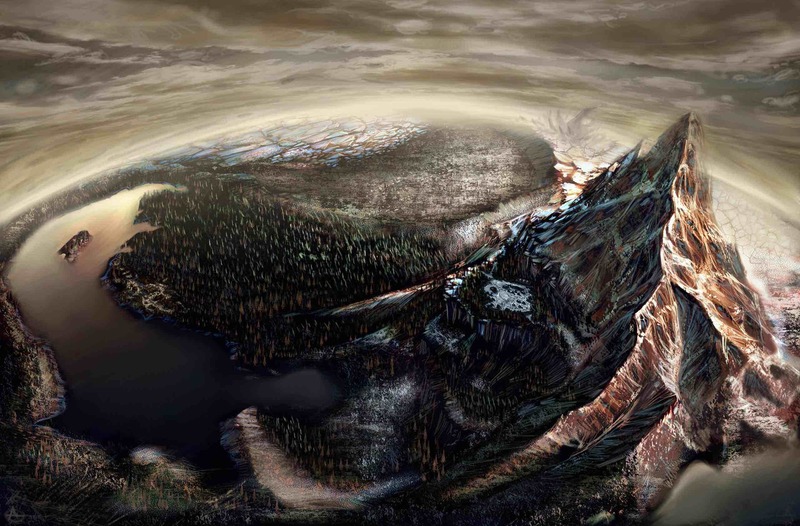 During this time Kököchin would go to her tribe and perform a right of passage and earn her own “Chosen Name”. She like many before her have to journey round the Dale with no supplies and only a knife to survive. Along the way she would be hunted by a group of Yeti, she would evade them and end up in the ruins of an ancient fortress it is there she would find two necklaces one with a Violent Purple Sapphire and one with a Golden Yellow one, she would take these both and give one to Laurel. She would eventually return to her tribe and take the name Temujin, Temi for short and be recognized as an adult and a full member of the tribe. 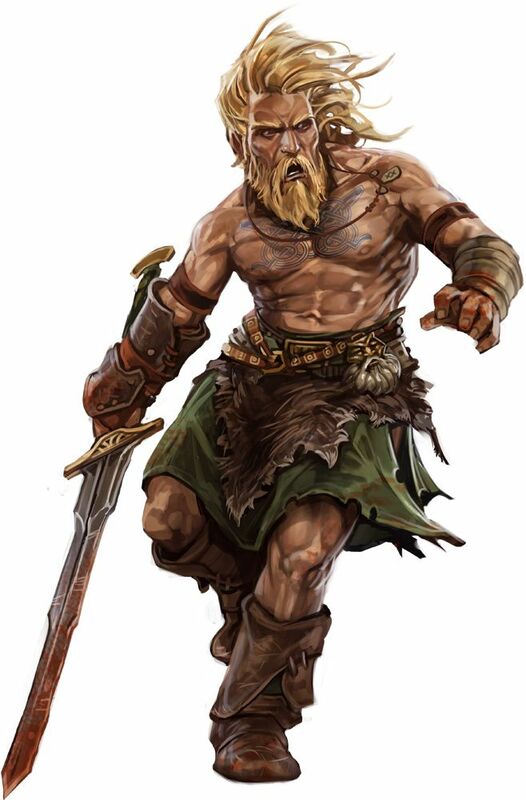 After years of training under the cleric they both found the gods that guided them for Laurel it was Gond the Lord of All Smiths and for Kököchin/Temi it was Aerdrie Faenya, little did they know that the bond they shared was being guided by another god, Kiltzi the Maztican goddess of love. Eventually the two would admit their feelings and decided to tell their respective peoples. the Tribe of the Bear did not care as long as Temi/Kököchin lived free and happy. Sadly Laurels family did not approve so in the dead of night the two girls left the Dale. 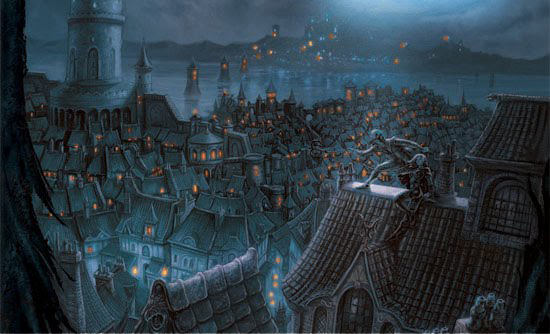 The first port of call was the city of Luskan but due to the fact that the only work they could find was that of whores or barmaids (they quickly found out that being a barmaid led to far to many bar fights) they decided it was not for them. So they quickly moved on, to somewhere more civilized. 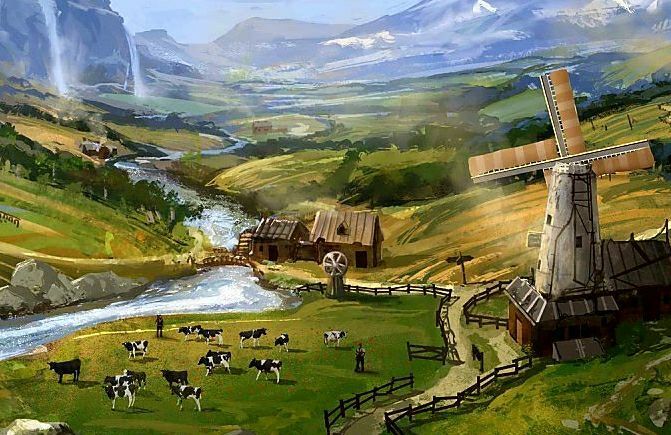 Eventually they ended up in Longsaddle and for a time the tiny hamlet was a great home, both women found work to keep them happy Kököchin/ Temi would teach the local children while studying with the local mages and Laurel would find work at the Blacksmiths. For nearly 2 years they lived happily there but the two girls began to grow distant from each other and eventually Kököchin who was now exclusivity calling herself Temi would keep getting strange visions that guided her to the Triboar Trail. Meanwhile Laurel would take up work as a Blacksmith on the island of Oman. Now Temi, separated from Laurel, has aligned herself with a Wood Elf Thief, a powerful human Wizard, a noble human Ranger and Dragonborn Bard who writes the most beautiful music as they go forth in the search of adventure. This is why I love Dungeons and Dragons it lets me create this amazing unique and wonderful character and not only that but she can interact with others like Remington a magic user that does not know his master is a fraud, the roguish borderline alcoholic Rinn who needs to break into everywhere he goes, the badass Aragona a women who is the last of her bloodline on hunt for revenge against a Dragon and finally the Dragonborn Tony who searches the world for beautiful art. Together they have defeated Goblins, killed a gang of thugs, saved a family and even managed to maybe loose Temi’s soul to a devil. The game lets us create such fantastic and wonderful characters, ones that affect each other as much as their players do. In the end I high recommend you give this game a go.